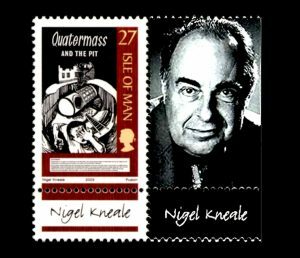 The late Nigel Kneale is considered to be the Island’s most successful radio, television and film scriptwriter, subsequently immortalised by his creation of the cult BBC TV science fiction series Quatermass during the 1950s. But a rarely heard play entitled The Road, recently aired on BBC Radio 4, revealed another side of his work. He was born in Dalton in Furness in 1922, but the Kneale family returned to the Isle of Man six years later, when his father, a journalist, joined his brother to run the Mona’s Herald. Upon leaving Douglas High School for Boys he initially studied law, but soon realised that his talents lay elsewhere, writing several short stories reflecting upon Island rural life and published in 1949 under the title Tomato Cain and Other Stories. He ultimately left the Isle of Man to study acting at RADA. and was presented with the Somerset Maugham Award, but then concentrated on writing for the burgeoning television industry. Voted Manxman of the Year in 1957, Nigel Kneale soon formed an impressive reputation as an innovative screenplay writer, although he did decline the early James Bond films. Adapted by Toby Hadoke, who kept as close as possible to the original script, he described The Road, last seen on television more than fifty years ago, as a lost classic. It centres upon the ghostly activity of a country wood in 1768, but playing against the backdrop of this story is the dichotomy between the scientist and the philosopher who jockey for position throughout this narrative of the supernatural; which ultimately becomes a tale of futuristic horror. The main players in this formidable production (played by Mark Gatiss and Adrian Scarborough) remain at odds with each others’ beliefs throughout the story, but there’s a terrifying realisation for one of them in the closing moments of the play. Unfortunately the original televised broadcast was systematically wiped, along with countless other programmes at the BBC during the 1960s/1970s, but the script, described as ‘one of the greatest missing masterpieces’, survived. A 1964 Australian TV version was also lost. Recorded at Maida Vale Studios in London and Salford’s Media City, Hadoke’s contemporary version benefited from some of the original radiophonic sound effects and the talent of actor Hattie Morahan, whose late father, Christopher, directed the original adaptation. The recording was also attended by Nigel Kneale’s widow, Judith Kerr. A successful writer herself (Mog, The Tiger Who Came To Tea), she spoke fondly about her late husband and his work. A study of Nigel Kneale’s productions reveal a tendency for prophecy, but look closely and you’ll also find a trail of subtle Manx references. One of the main characters in The Road, Squire Hassall, may well be named after the man who lies in Malew churchyard, better known these days under the sobriquet of the Vampire Grave. Additionally, in the story, unseen people walk upon cobbles beneath the road on Michaelmas Eve and strange cries rent the air – a parallel, perhaps, with the ‘little people’ travelling to and from an ancient barrow (burial mound) to Maughold churchyard using underground passageways, and the sound of angry voices at a hill fort in Castletown. He also introduced Manx topics into his radio drama The Long Stairs (based on the Snaefell mining disaster) and his only stage play Crow, centring on the life of the Manx slave trader Captain Hugh Crow of Maughold, which regrettably never went into production. 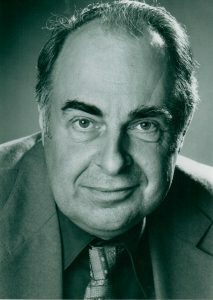 Nigel Kneale died in 2006. 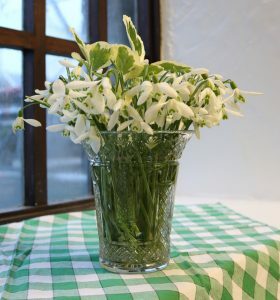 The blossoming of early snowdrops often provides a lifeline into better days, with early birds scouring sheltered gardens and country nooks for signs of change in the final days of winter. But one of the most popular venues for sighting this delicate, but yet robust little gem, is Dalby House, situated close to the village of the same name on the west coast. 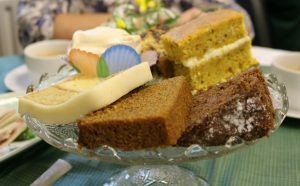 It’s an annual event organised by a successful team from St James Church in Dalby, which, with the kind permission of Mrs Clarke, allowed a large number of afternoon strollers to sample the delights of her private grounds. There was a rich display of snowdrops upon entering the driveway, but it’s the sheltered woodland at the rear of the property which was awash with an explosion of ethereal beauty. It was a heart-warming experience which couldn’t fail to lift the spirits of those who strolled nonchalantly amongst the blooms. Different varieties of snowdrops have been cultivated over the years at Dalby House, some of which were available for sale on the day. This was followed by a sumptuous afternoon tea back at the church (something for which they’re renowned) amongst good company and lashings of tea and cake in front of a welcome open fire. 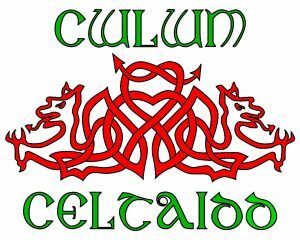 The Celtic festival season bursts into life this weekend with Cwlwm Celtaidd, a family-friendly festival which retains strong links with the Isle of Man and presents a packed weekend programme of concerts, dances, workshops, street displays and legendary bar sessions in the seaside town of Porthcawl. Returning after a year’s hiatus to assess the festival’s future strategy, Cwlwm Celtaidd has gone into partnership with TRAC Cymru, an initiative which promotes and encourages the participation and development of the folk music scene in Wales. 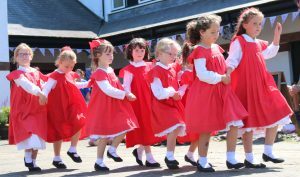 Manx group Perree Bane, who will attend this year’s festival, has forged a long term relationship with organisers of the event, presenting a striking presence with their colourful costume adapted from historical record, and often seen at local events. Based in the south of the Island, the group’s name is taken from the Manx Gaelic words for ‘white jacket’, which partners the Loaghtan wool trousers worn by the men of the group. Although still firmly linked to its home town of Porthcawl in South Wales, a further major change for the festival is a move into the Hi Tide Resort and Complex, which first opened its doors in 1947 as a beach shop with refreshment stalls, but has developed into the borough’s top cabaret and function venue. Cwlwm Celtaidd also provides a great opportunity for an early, seasonal break – combining local amenities and outdoor pursuits with the richness of a fast-paced and rewarding festival. Following an enquiry from Sam about the Mary Weller award at Yn Cruinnaght, Chloë Woolley tells us she had a root in her stock/archive boxes cupboard at work at Culture Vannin, and, unlike the silver cup she had in mind, discovered . 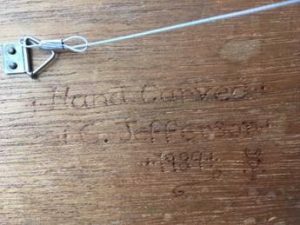 . .
She thinks it had been stored in the attic of Ramsey Town Hall and passed to Culture Vannin a few years ago. Now the LMS committee will need to discuss its future. Members’ ideas welcome. 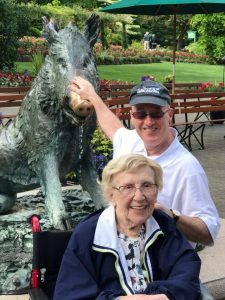 Brad Prendergast and the source of his Manxness, his mother, Florence. The popular quiz that features in the quarterly magazine of the London Manx Society for March has been won for the third time running by an overseas reader of Manx descent. After successive wins for Richard Moore of Durban, South Africa, originally from Kirk Michael, it’s the turn of Brad Prendergast of Chicago Manx Society who is also a vice president of the North American Manx Association. His prize is £20 of fuel kindly donated by Mylchreest Car Hire when he rents one of its vehicles next time he is at Ronaldsway. It was a close run thing. He beat one of the regular London winners by getting his answer to the editor one hour ten minutes faster. The House of Manannan is to be found in (a) Castletown, (b) Douglas, (c) Peel, (d) Ramsey? Cashtal yn Ard is a (a) natural rock outcrop (b) Neolithic tomb (c), 9th century fortress, (d) 17th century army training area? Castle Rushen clock appears on the Manx coin of the denomination (a) 10p, (b) 20p, (c) 50p, (d) £1? The Orchid Line runs in (a) Ballaugh, (b) Castletown, (c) Douglas Head, (d) Port Soderick? The missing Mary Weller Yn Cruinnaght award for Solo instrumentalist 11 years and under was found at (a) Andreas Village School, (b) Gaiety Theatre, (c) Manx Museum, (d) Ramsey Town Hall? The saga of the missing Yn Cruinnaght award had featured in a 2018 edition of the magazine. We have posted the tale above. Manx National Heritage is proud to announce a special collaboration with York Archaeological Trust, which will see internationally significant objects from the Isle of Man go on display at JORVIK Viking Centre. 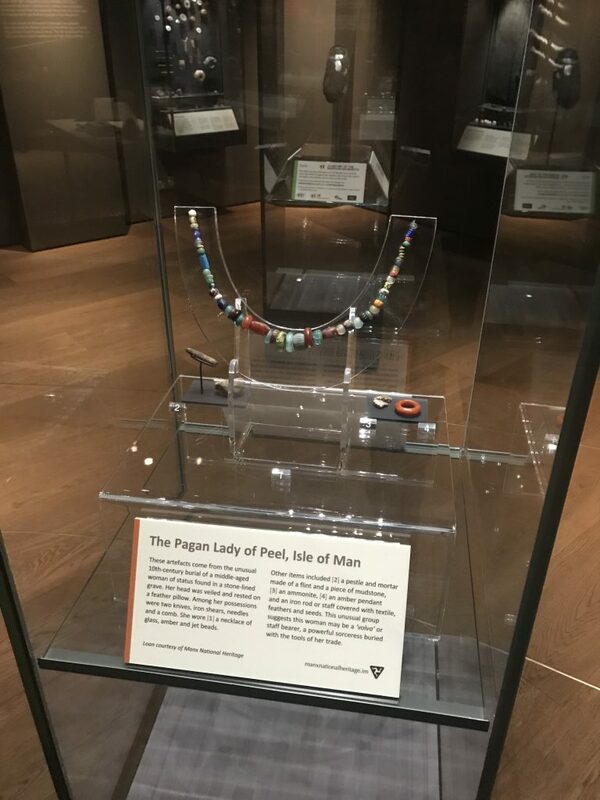 The items to be featured include the Pagan Lady’s necklace, excavated on the Isle of Man from the Pagan Lady’s grave at Peel Castle, which is one of the richest Viking Age female burials outside of Scandinavia. “Working with other organisations is a vital part of our work in promoting the Isle of Man’s Viking cultural heritage. We are proud to be part of the wider community of heritage sites and museums who promote understanding of the Vikings in Europe and worldwide. The Isle of Man and York are part of the Council of Europe’s Viking Route of Cultural Heritage and our collaboration has grown over several years”. The burial of the Pagan Lady over a thousand years ago is important because it illustrates the high status of some women in an age traditionally associated with male dominance. Her pagan burial within an already established Christian cemetery is also significant, indicating a willingness to share a special place. The necklace has previously featured in the BBC and British Museum Series ‘A History of the World in 100 Objects’. “The necklace will be displayed alongside other artefacts from the Pagan Lady’s burial including a large amber bead, miniature pestle and mortar and a fossil ammonite charm, which we are delighted to share with our partners at JORVIK”. The necklace and artefacts from the Isle of Man go on display at JORVIK from now until August 2019. To coincide with the display of the necklace, representatives from Manx National Heritage will be speaking at a number of events in York including the ‘2019 Viking Festival’, ‘Follow the Vikings Roadshow’ and the final best practice seminar of the Creative Europe project. Image: Pagan Lady’s Necklace on display in York. Manx National Trust. With the rise in feminism and raised awareness of the environment dominating the headlines, advocates may look towards an inspirational leader to guide them through their campaigns, but historically St Bridget, who has links with the Isle of Man, may well tick all the boxes. Believed to have been born near Dundalk, County Louth, in the mid fifth century, St Bridget (Brigid (Irish) Breeshey (Manx)) is a much celebrated figure in Ireland, typically remembered for establishing an abbey and church in Kildare on a site now occupied by St Brigid’s Cathedral. 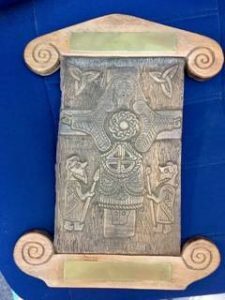 However, confusion arises with similarities to a goddess of the same name and many believe she is a merging of two people, sitting on the boundary of pagan mythology, Druidism and Christian spirituality. St Bridget, whose feast day is celebrated on the 1st February, is said to have held a unique position in the Irish church and society of her time, and as Abbess presided over the local Church of Kildare and was leader of a double monastery for both men and women. Stories and legends abound about St Bridget, but what emerges is a portrait of a strong and gentle woman, a powerful leader, good organiser, skilful healer and a wise spiritual guide, who presents what is termed the feminine face of God. Often depicted as a peacemaker, this has been immortalised in the St Bridget’s Cross, a token of goodwill between neighbours after a local quarrel. A version of this may also be found on the Isle of Man. The timing of her feast day sits perfectly with the celebration of spring, new life and St Bridget’s natural attunement of the seasons and cycle of nature. She was often referred to as the Saint of Agriculture. She has been designated a patron of many things, from chicken farmers and fugitives to printing presses and sailors, but the list also includes babies, children whose parents are unmarried, dairy-maids, infants, midwives, milk-maids and nuns. 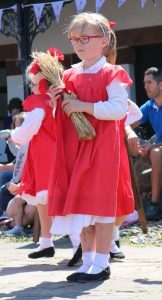 Although time blurs the edges of historical record, it’s widely reported that St Bridget visited the Isle of Man as a young girl to receive the veil from St Maughold, although other sources place this ceremony elsewhere. At this point she is said to have founded the Nunnery, near Douglas, ultimately dissolved during the sixteenth century, but historians have been frustrated by lack of reference and a long term dependency on traditionary evidence. However, there’s no doubting that she was a popular saint on the Isle of Man. You’ll find her name on both a northern parish and its church and seven ancient keeill (chapel) sites, as well as the aforementioned nunnery. 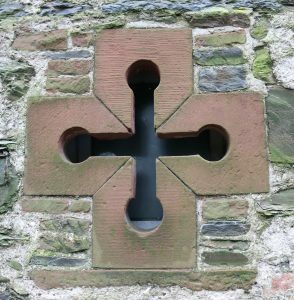 Her effigy is also said to be represented on the ancient cross close to the churchyard at Kirk Maughold and on the armorial bearings of the Manx diocese. 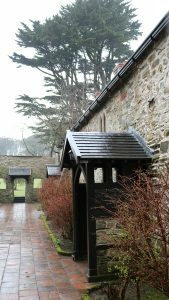 St Bridget’s Chapel, probably dating from the twelfth or thirteenth century, on the Nunnery estate survived, becoming stables before re-established as a place of worship from the late nineteenth century until 1998, when it was deconsecrated. Meanwhile an old custom practised on the eve of St Bridget’s Day on the Isle of Man involved gathering a bundle of green rushes, standing with them on the threshold of the house and inviting the saint to visit; ensuring peace and plenty for the coming year. Some might also sweep out the barn before placing a bed, chair and table with bread and cheese, a lighted candle and a quart jug of good Manx ale in expectation of the desired visitor. 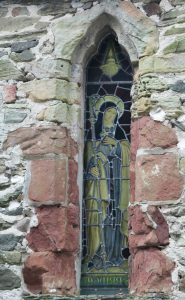 A Manx folksong, collected by Mona Douglas from Mrs Bridson of Glen Maye, entitled Invocation to Saint Bridget, readily underpins this tradition. Featuring jazz enthusiast Dave McLean on bass and keyboard wizard Anglin Buttimore, an unmistakable feature of the talented line-up is the distinctive sound of lead vocalist and songwriter Aalin Clague, who also introduces the mellow note of the cornet to selected tracks. She’s accompanied on vocals by another well-known composer and flute player Breesha Maddrell and ukulele performer Rob Cain (all from the Manx electro-folk band Moot) and drums exponent Danny Kneale. And there’s a guest appearance from Jack McLean (Scran) on accordion. Members of the band have performed independently at a host of worldwide festivals, with music from Clash Vooar and Moot recently featured on the BBC Radio 4 programme Notes from a Musical Island, but in this incarnation have already notched up several successful performances at local festivals. 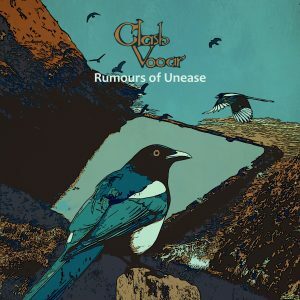 Presenting a selection of re-imagined, traditional music and original songs, Clash Vooar specialise in idiosyncratic storytelling which has its roots in Manx folklore, but successfully locks in prog rock keyboard, jazz inflection and evocative samples mastered by Rob Cain. 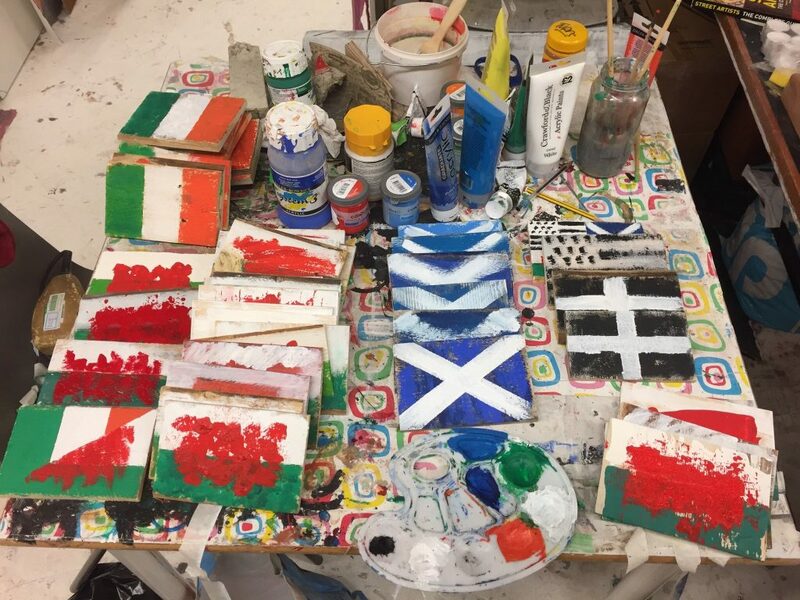 This exciting and revolutionary album unleashes a freedom of expression which has been unequivocally shaped by the band’s diversity with sound and experimentation, taking Manx music into an exciting new era. Further information about Clash Vooar is available on their Facebook page.